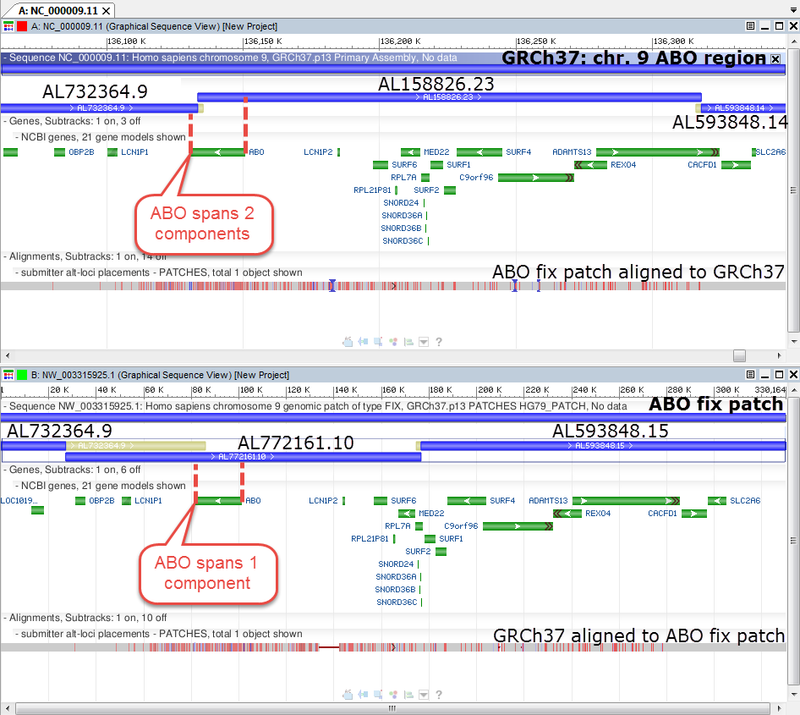 GRCh38 has started receiving patch updates, and this blog post describes a FIX patch to the ABO gene, located on chr. 9. 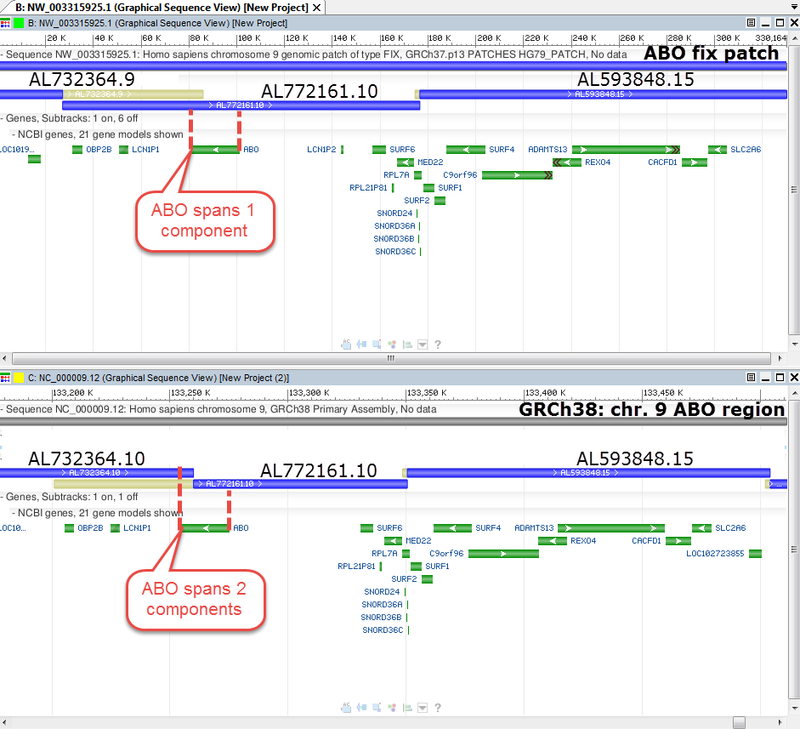 You might have been aware that the GRC released a FIX patch to ABO for GRCh37. So why is there an ABO FIX patch for GRCh38 as well? In GRCh37, the ABO gene was annotated on sequence derived from two RP11 library clones, AL732364.9 (RP11-244N20) and AL158826.23 (RP11-430N14). However, the RP11 library is derived from a diploid genome and analysis demonstrated that the two sequenced clones represented two different Type O ABO alleles. As a result, the GRCh37 chr.9 representation of ABO was an invalid haplotype for the gene (Fig. 1, top panel). Fig. 1 Top: ABO region in GRCh37. The gene is derived from 2 components, resulting in an invalid haplotype not seen in any individuals. Bottom: ABO fix patch. The gene is derived from a single component and represents a known Type O haplotype. To address this issue, we identified a clone from the CalTech human BAC library D that captures the complete ABO gene (CTD-2612A24). The sequence for this clone was finished (AL772161.10) and inserted into the chr. 9 tiling path, replacing RP11 component AL158826.23. By setting the switch points between AL732364.9 (RP11-244N20) and AL772161.10 (CTD-2612A24) so that the full insert sequence of the new component contributed to the scaffold, we were able to provide a complete and valid ABO Type A1.02 representation for the gene. Thus update was provided as a FIX patch scaffold (GL339450.1) for GRCh37. (Fig.1, bottom panel). Unfortunately, this update is not reflected in GRCh38. Subsequent to the final GRCh37 patch release (GRCh37.p13) and the release of GRCh38, the sequence to RP11-244N20 was updated (AL732364.10) and inserted into the chr. 9 tiling path. The switch points between the updated sequence AL732364.10 and AL772161.10 were set incorrectly (Fig. 2). This resulted in an invalid haplotypic representation for ABO. Whereas the GRCh37 representation was a Type O/O mix, in GRCh38 it is a Type A/O mix. Fig.2 Top: ABO fix patch. Gene is derived from a single component. Bottom: ABO region in GRCh38. The gene is derived from 2 components, creating an invalid haplotype. This is fixed by the GRCh38 FIX patch. The GRCh38 FIX patch scaffold KN196479.1 corrects this switch point and provides the same single haplotype representation for ABO that was present in the GRCh37 FIX patch scaffold. This re-patching of the ABO gene again restores the functionality of the gene with the valid Type A1.02 haplotype.